NavPress Publishing Group, 9781631463532, 249pp. 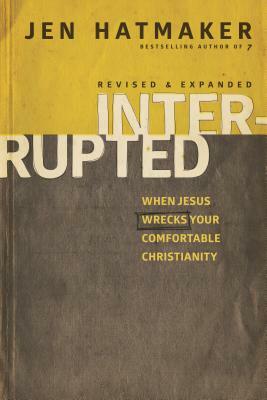 Interrupted follows the author's messy journey through life and church and into living on mission. Snatching Jen from the grip of her consumer life, God began asking her questions like, "What is really the point of My Church? What have I really asked of you?" She was far too busy doing church than being church, even as a pastor's wife, an author of five Christian books, and a committed believer for 26 years. She discovered she had missed the point. Christ brought Jen and her family to a place of living on mission by asking them tough questions, leading them through Scripture, and walking together with them on the path. Interrupted invites readers to take a similar journey. Jen Hatmaker is the author of A Modern Girl's Guide to Bible Study: A Refreshingly Unique Way to Look at God's Word and A Modern Girl's Bible Study Series. Her sixth book, "Ms. Understood," released in Summer '08. With a heart for the women of her generation, she speaks at retreats and conferences around the country. Jen resides in Austin, Texas, with her husband, Brandon, and their three children.